The team at Chroma Noir, the guys behind Halide, teased us recently about a new app they were working on and were to release. There was a lot of buzz on Twitter with many a speculation for what it could be, including a guess from yours truly. I thought they were going to release a RAW editor. Boy, was I way off. The new app by Ben Sandofsky and Sebastiaan de With is called Spectre and it’s every bit as cool as Halide. Spectre is a specialty product made to create three types of long exposure images: light trails at night, the silky smooth look of moving water, and making things “disappear” in a scene, albeit using the same technology for each. The “spectacle” of Spectre is that it gives us the ability to take photos like this without using a tripod. Spectre performs best with the latest iPhones, from the 8 to the current Xs, Xs Max and Xr, although it will work on models as old as the iPhone 6. In the newer phones, it uses Artificial Intelligence via the Neural Engine in the A11 and A12 Bionic chipsets to detect the scene and provide the proper Image Stabilization for a good quality photo. By good quality, I mean one where the still parts of the scene are perfectly clear and the moving parts, whether it’s water, people, cars – that sort of thing, are blurred or don’t even show up in the exposure. The app will work in, as I mentioned, the iPhone 6 and up, but the 6 and 6 Plus will output files of a lower resolution, due to chipset performance I suspect. The guys at Chroma Noir have built a stabilization indicator, front and centre, into the UI to show you just how much you are moving your iPhone. This is invaluable when trying to get a shot handheld. I was able to get a good, clean 5-second exposure of this river, even near dusk, where the still areas are tack sharp while the water – and ducks in this case – are blurred. Doing this requires some discipline. You need to hold the iPhone as still as possible, tucking your elbows into your sides or resting your hands on something solid – but not an idling car, that doesn’t work. It also helps if you control your breathing. I will either hold my breath or exhale very slowly while going through the exposure time. You can turn off Stabilization when using a tripod or setting your phone on a stable surface by tapping the Stable icon, but Spectre has tripod detection built in so it shouldn’t be an issue anyway. 5-second exposure, handheld, created with Spectre. One of the cool things you can do with Spectre is saving images as Live Photos, just like the Camera app that comes with your iPhone, and it doesn’t matter which of the three exposure times you select. This is on by default, but there’s a toggle in the settings if you don’t want to save the Live Photo. You would think to turn this off would save you some space, however, that doesn’t seem to be the case. From within the Spectre’s photo browser interface, you can save a shot (taken originally as a Live Photo) as a still image. When I compared a Live Photo to a newly saved still version of the same image, the file size was the same. Something to note is that if you turn off the ability to save the Live Photo, once you close the app and come back to it later, that function is turned on again. Another nice feature of Spectre is the ability to save the video from a Live Photo. As you must have heard by now, Apple’s Live Photos are created by recording a video for 3 seconds, and the final image you see is what was captured halfway through the process. Spectre records its Live Photos the same way but the final output is the final frame of the whole recording, whether it’s 3, 5, or 9 seconds. After capture, you have the choice of saving or sharing your image as a still photo or a video, provided you have it toggled to save the Live Photo. If that’s toggled off, the option to save the output as a video is greyed out. Whatever the case, your output is saved to your Camera Roll. And like the Apple Camera’s Live Photos, you can go into Edit Mode in the Photos app and change the Key Photo to another frame if you don’t like the way the final image looks. If you select the first image as the Key Photo, you get a sharp image without any of the blurs from the long exposure process. The advantage of this is if you accidentally moved at some point during the exposure, you can adjust the Key Photo to a point earlier in the process where the still parts of the scene were sharp before any movement. You will lose some of the blurred effects but at least you have an image you can use. I would be remiss if I didn’t talk about the app’s interface. If you held two phones side by side, ideally the same model, with Halide open in one and Spectre in the other, you would notice a lot of similarities, and rightly so since they’re sister apps. The viewfinder space is identical, the shutter button is in the centre near the bottom, though not identical in size or position, and overall, the design is such that you can access the controls with one hand, even on the Xs Max. The fonts used in the Spectre UI have carried over from Halide and according to Sebastiaan De With, the designer half of Chroma Noir, the fonts are taken from the those used on an old SLR camera lens. Like Halide (above left), Spectre makes good use of the space at the top of the screen beside the notch on the newest generation of iPhones with the Light Trails mode switcher on the left and the exposure value on the right. The options for Light Trails are Auto, On, and Off. I have no issues with leaving this on Auto because I feel pretty confident that the AI in Spectre is smart enough to turn on Light Trails Mode when it needs it. The EV control to the right of the notch is a little icon that resembles the sun and is greyed out when the value is 0. You can tap the icon to activate the EV slider that appears on the right side of the viewfinder or simply touch the screen and slide your finger up or down to bring up the slider and adjust the exposure. The sun icon will then turn the brilliant green found throughout Spectre’s UI and is accompanied by the exposure value. 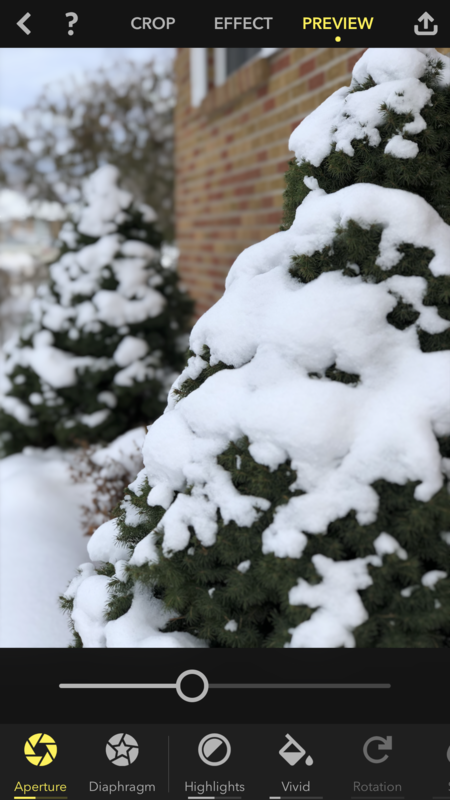 The exposure time can be adjusted to one of the three preset lengths using the dial that protrudes from the lower right corner; just slide it with your thumb if you’re holding the iPhone in your right hand. Doing long exposure photography with an iPhone is certainly nothing new. Slow Shutter Cam has been around for years and has been the best app I’ve ever tried for this type of work. Camera+ 2 is another app that does an amazing job with long exposures, along with Cortex Cam, NightCap Pro, and I’m sure there are others. I put Spectre up against Slow Shutter and Camera+ 2 to see how it looked and quite frankly, there weren’t any differences visually, especially since, to my knowledge, they’re all using the same technology under the hood to create an exposure. What sets Spectre apart is its ability to get the shot handheld. This is huge for casual shooters looking to be able to take a photo that’s different from anything they’ve tried before, and it’s especially handy for getting a quick shot to post to Instagram or other social media outlets. If I wanted to get picky and point out the smallest of visual differences between the three shots you see here (click on one to see larger versions), I’d have to say the one from Camera+ 2 is slightly warmer. Start looking beneath the surface of these apps and Spectre provides three options for saving its files, Live Photo, still image, and video. That’s cool, but what if we wanted to save a file for creating a large print? There are those who like to save their files in TIFF format to make use of as much information in a file as possible. Slow Shutter and Camera+ 2 give us this. To most people though, I doubt it’s an issue because the final outputs for the image files from Spectre are full resolution renders. RAW image capture is currently impossible with long exposure photography on iPhone so there’s no point in even going there. The video files are only 720 pixels high, which is too bad because Instagram – where most mobile photos end up these days – can accommodate up to 1080 pixels, so I’m hoping this is something that can be improved upon. I believe Spectre is good enough to please eighty per cent of its users eighty per cent of the time. When Chroma Noir released it, it was strong out of the gate. Spectre hit the top of the charts in the US App Store by day two. That’s a testament to just how good these developers are, and just how popular Halide must be. Ben Sandofsky, who used to be on Twitter’s engineering team, and Sebastiaan de With, a former member of an Apple design team, have come up with an app that can do long exposures handheld. This has never been done before. You can’t do this with any traditional camera! And it may not be perfect, but it’s pretty darn good. And I bet it only gets better as they continue to work on it. When I first got into mobile photography, or more specifically, iPhoneography, I was dead set against using any accessories with my iPhone. Whether it was add-on lenses or detachable devices that made my phone work more like a traditional camera, I was having no part of it. As my journey in iPhoneography progressed, I slowly warmed up to the idea of using accessories. Now I have way more than I would ever have imagined. I mean, I’m not overwhelmed with accessories, I just have ones I would actually use, from an Osmo Mobile to Moment lenses to what I’m going to write about in the paragraphs to follow. In 2016, some folks from the US and Sweden got together and tried to come up with a case for the iPhone that would, according to one of the guys, have the look and feel of an old Ricoh GR to get away from having their fingers all over the screen while they took pictures. This was the inception of Shuttercase. After many attempts to produce a successful design, the team decided to cancel their plans. However, when the iPhone X was released, they felt the photographic capabilities of this newly designed iPhone warranted another effort and they revitalized the project. They started an Indiegogo campaign and although they didn’t reach their funding goal, they believed in their idea so much that they took whatever funds they received and went ahead with production. And quite frankly, I’m glad they did. I backed the campaign when I had an iPhone 8 Plus, and thanks to their awesome customer service, when I asked if I could change my order to fit my new Xs Max, they didn’t hesitate to make the change. I received my Shuttercase a few days ago and I had thought of doing an unboxing video, but as usual, I forgot about making the video and just tore into the Shuttercase. What can I say? I’d been waiting for this case for months! The Shuttercase packaging is very well done. I want to start this review by saying how impressed I am with the packaging. The black box with silver embossed lettering and imagery is very elegant, and the diagrams on the sides of the lid accurately represent the case, though not to scale, in vivid detail. There’s just enough branding on the box, including their website, so there’s no mistaking who they are or what their product is. The lid fits nicely over the bottom half of the packaging and is similar in fit to any of the Apple products I have purchased over the years. It’s like Shuttercase took a page out of Apple’s packaging notes… if there is such a thing. The first thing I see once the lid is off is a booklet with instructions for how to use the case, etc. That’s something that I don’t need to go into, other than to say it’s informative and useful. Next is the case itself. It sits in a form fitted plastic tray. Remove the case and the tray and underneath is a foam pad with three cutouts for the camera handle (I like to refer to it as the battery pack), a felt pouch for carrying the battery pack when you aren’t using it, a small micro USB to USB charging cable (in with the pouch), and a low profile hand grip that slides in where the battery goes when not in use, plus there are two small cutouts for the thumb buttons (they provide a spare). With the camera handle installed, the case is designed to stand on its own, which is great for watching videos or going on FaceTime. So let’s get to the case. The build quality is excellent. It fits the phone as good as any well made case and is easy to put on. Since this review is for using the case for photography, I’ll address using it with the camera handle installed as opposed to the hand grip. The camera handle slides into place along a pair of grooves and finishes with a click. It fits so well it looks like it’s part of the case body. There’s a small cable that hides nicely in the bottom of the camera handle and when you want to charge your phone, simply remove the handle, flip the cable out, and after reinstalling the handle, plug the cable into the Lightning Port of your iPhone. The battery in the camera handle is a 3,000 mAh unit that takes about 6 hours to recharge. The literature in the box says the battery will take about 2 hours to charge an iPhone X from 10 percent to about 70 percent. For my Xs Max, I’ll have to try it out to see how much of a charge I can get. Once the phone is snapped into the case, there’s a small groove on the side of the body where the thumb button slides into place. It also goes into place with a slight click. The thumb button is there to make holding the phone ergonomically correct, but it juts out over the screen by about 2 mm. However, I haven’t found it to be in the way of anything yet. As for using the volume and lock buttons on the phone, they’re fairly decent in the way they operate through the case. The volume down button is a little soft but that’s because it’s mechanically connected through the back of the case body to the shutter button on the other side. The little mute switch is difficult to switch to silent and because of the angle of the case body going from back to front, I couldn’t get my finger in the opening to switch the ringer back on. I think Shuttercase would be doing us a favour if they made the opening a little bigger. The secret sauce of Shuttercase is the shutter button itself. I mentioned that the shutter button and the volume down button are mechanically connected through the back of the body. I think this is genius. It allows you to use Shuttercase with any camera app without the need to connect to the case via Bluetooth. I also mentioned that the volume down button was a little soft to the feel because of the mechanical connection to the shutter button. Obviously, the same soft feel is present in the shutter button which makes it feel more like the shutter release of a DSLR without the half-press-to-focus function. Having to use a little pressure to take a photo with this kind of button isn’t a problem; as an avid tapper of the virtual shutter on the screen, I just have to get used to using it. Holding the phone with Shuttercase feels decent in the hand. Wrap the lanyard around your wrist and there’s no worry of dropping your iPhone. Shuttercase makes one-handed photography a breeze and would come in handy for those who like to take selfies. One thing I’ve noticed is how convenient it is to work some of the camera functions in Halide (my go-to camera app) while holding Shuttercase. Switching from the 1x to the 2x camera on my Xs Max is a breeze. Shuttercase promotes their product as a modular case. This is not only because you can remove the camera handle and replace it with the hand grip, but also because the lens mount plate is interchangeable. I use Moment lenses so the mount plate is designed to accept Moment lenses. For the Shuttercase that fits the iPhone 7 Plus and 8 Plus, they have a mount plate that will accept SIRUI lenses, which have a mount similar to Moment, and the Shuttercase website promises there will be more to come. The mount plate may or may not arrive at your door already installed on the case but mine was. My Moment lenses fit the plate nicely, although a little tighter fit would be better, I feel confident they won’t fall off. The immediate area around the lens mount opening on the Shuttercase is thinner in construction compared to the Moment photo case I have. This is something the guys at Shuttercase will need to work on, and I’m sure they are. When I attach a lens, the thinness of the mount area gives a little in the centre on the part between the cameras, which makes the lens sit slightly askew. This affects the picture quality in that there is some aberration along the sides of the photo. If Shuttercase are able to beef up the sturdiness of this component and make it more like Moment’s cases, they could sell a newly designed mount that can replace the current one. However, if you aren’t using any lenses, it’s obviously a non-issue. Shuttercase is a small company. They had an idea that they almost completely gave up on but thankfully, they decided to see it through. Their product isn’t made to improve your photography — that’s our job — but it will make taking photos a little easier and perhaps more fun, and with the battery pack, we can have more fun longer. If you ever thought you’d like your iPhone to feel more like a camera when you’re out taking photos, Shuttercase is the way to go. I’m glad I bought one. One of the biggest shortfalls of the iPhone, or any mobile phone for that matter, is the ability to shoot good quality photos at night. The small sensors in these devices have small pixels which make it difficult to capture enough light for this type of work. However, there are ways around this limitation if you have the right tools and the patience to put them to use. The best way to be successful at night photography on a mobile phone is to take a photographic approach to it. Don’t just point and shoot, that will give you a noisy, or grainy image in most cases. The tools I’m referring to are a tripod and a camera app that will allow you to take manual control of the exposure. There are a few different apps out there that have this capability and I’m going to talk about one that I rely on most for night photography. First, the tripod. Most mobile photographers never think of using a tripod because there’s a preconceived notion that mobile photography should be as simple as aim and fire. For most situations that’s fine but if you want to be serious about night photography with your phone, you need to be serious about your approach. You don’t need to spend a fortune on a tripod; just a small one will do the trick because the phone is much lighter than a DSLR, but get one that is sturdy, not too flimsy. You also need a mount for the tripod that will hold your phone. A simple Google search for “tripod head for mobile phone” should get you pointed in the right direction. There are a couple of camera apps that I like to use for night photography but I’m just going to talk about Camera+ 2. I like Camera+ 2 because when you activate Slow Shutter Mode it has the ability to do a 30-second exposure while allowing for an ISO setting of 0.01. Slow Shutter Cam is another app that’s good for night shots and has been around for years but the ISO only goes down to 25. Still pretty good for quality, but not as good as 0.01. With the ability to dial the ISO down to an insane value like 0.01, I can produce a night shot that has absolutely no noise, which makes for a very good image. It should be noted though that good quality night photos taken on a mobile device won’t be as crystal clear as ones shot with a traditional camera with a much larger sensor but hey, we get it, right? There are different types of subject matter to capture at night and they will almost always include lights of some sort. Shooting stars or the Milky Way is, well let’s just forget about that. It’s not happening. It can be done to a degree, but not before doing intense research and acquiring some extra equipment. An urban setting like a simple street scene is a great place to start if you’ve never experimented with night photography before. Before setting your exposure values, once you have your phone set up on the tripod, tap on the screen where you want the focus point to be in the frame. In Camera+ 2, you’ll need to activate Slow Shutter Mode and you do this by tapping the plus sign next to the shutter button. You’ll see a row of icons pop up and when you slide them around, look for the one that looks like an aperture ring. It will be labelled “Slow Shutter”. Now for setting up your exposure. In traditional photography, exposure is the combination of three elements: aperture, shutter speed, and ISO. Most mobile phones do not have an adjustable aperture, however, there are a couple of devices that do have this feature, most notably the Samsung Galaxy S9 which sports a wide-angle camera with f/1.5 and f/2.4 aperture modes. But since the iPhone has a fixed aperture, we’ll focus on shutter speed and ISO. If you want a good quality night shot with little to no noise you need the set the ISO as low as the scene will allow, and that will depend on how bright the scene is. The brighter the scene, the lower you can set the ISO at any given shutter speed. The image below illustrates how ISO affects the quality of an image. I zoomed to 100% on two photos taken of a sign above the door of a church. The left side of the frame was shot in Camera+ 2’s Auto Mode where the camera picks the best settings for the situation at hand. In this case, it was a shutter speed of 1/15th of a second at ISO 640. The higher the ISO, the more noise. The right side of the frame was a 30-second exposure with an ISO value of 4. As you can see the image is very clear with virtually no noise, and it’s especially evident in the light background of the sign. It’s also a good idea to make sure the Camera+ 2 app is set up to show you what your final exposure will look like in real time. To do this, go to the settings icon in the lower right corner of the screen, then to the Advanced Controls, and toggle on Live Exposure. When taking the shot, it’s good to use a self-timer because when you tap the screen to initiate the exposure, you could be getting a bit of camera shake, and the lights in a night scene will look blurry throughout the exposure time if there is shake when it starts. I never recommend using the volume control on the phone as a shutter release as this could easily cause camera shake too. There is a self-timer function in Camera+ 2 but unfortunately, it’s a mode of its own and can’t be used in conjunction with the Slow Shutter mode. The best thing to do here is to plug in your headphones and use the volume button as a remote shutter release. Try different exposure settings and see what will be right for you and the shot you are trying to get. It’s impossible to tell you which settings to use because every shot will be different. I recommend getting the ISO to a fairly low setting first, then adjusting your shutter speed until you see the image on the screen look the way you want for the final output. If you can’t achieve the result you desire, adjust the settings until your exposure is more to your liking. Don’t be discouraged if the first few shots don’t turn out as you hoped. This kind of work takes practice. That’s why I said earlier that you need to have patience. Hit me up on Twitter if you have any questions or to show me some examples of your success. My username is @mcmillan_photo. I’d love to see how you do with this, especially if you’ve never tried it before. There’s always been a divisive gap between the two major forces in the art of photography. For decades we’ve seen and enjoyed the traditional camera style, now known as DSLR photography, and in recent years, the growth of mobile photography has been very difficult to ignore. Its popularity has taken off to where it has all but obliterated the point and shoot market. But still, there are some differences of opinion with regard to the integrity of mobile photography. DSLR makers like Canon and Nikon have some amazing cameras, but the speed at which they upgrade with new models seems slow for some of their customers. I’ve heard professional photographers on some podcasts talk about features they want but don’t understand why the manufacturers can’t, or at least aren’t, adding them to their camera lineup. I’m sure it’s not easy to make the “best” camera on the market. This is a very exciting time for photography in the mobile space. The cameras in the current line of phones are obviously the best they’ve ever been and the competition among phone makers is getting fierce. It’s not a megapixel war like we’ve seen in the DSLR space, but rather a battle to see who can get the best image quality from these very small lenses and sensors. I would guess that releasing a phone with a camera that has a larger lens opening than the others is one of the bigger checkboxes on the list of features for these companies, but that can’t be an easy endeavour technically because of the physics involved. As an iPhone user and one who follows Apple more closely than I do any other tech company, I can’t fairly speak about the technology in devices by Samsung, HTC, LG, etc., but I can say that these phone makers do have their loyal customers who are passionate about their phones. Photography brings out some of that passion because photography is art, and art is an expression of one’s vision. For me, the iPhone produces images that best suit my vision and artistic style. So, what is this gap that’s getting smaller? For one, it’s the ability to tell whether a photo was taken with a DSLR or a mobile device. People have been questioning me on this for a couple of years now which is a testament to the iPhone’s ability to produce a good quality image. And I think it’s worth mentioning that these little cameras in our beloved phones have their limitations. Some of these limitations can be overcome thanks to the expert app developers out there who have been blessed with the creativity and intelligence needed to supply us with the tools needed for the job. Apple introduced this technology in the iPhone 7 Plus with Portrait Mode, which uses both the wide angle and telephoto lenses to gather enough data from a scene to create a depth map and use that information to produce a photo with a sharp foreground and a nice bokeh in the background. The only other device on the market that uses a form of Portrait Mode, that I know of, is the Google Pixel 2. I believe Samsung has a feature where you can select the focus after the shot, but this is not promoted as a form of Portrait Mode. The Pixel 2 also performs its magic after the shot, most likely because it only has one lens, but it does an impressive job at creating a portrait with a soft background. I may be a bit biased, but I think the iPhone does the best job with Portrait Mode, and it does it all live with a preview of the scene before you take the shot. I mentioned app developers earlier and how they help us overcome some of the limitations of mobile photography. This brings me to what I see, at least in my experience, as the one app that closes the gap closer than any other to this point: Focos. Yes, that’s how they spell it and it does a fantastic job with how it allows us to select a point of focus after the shot, as well as, get this, change the depth of field in a way that is similar to changing the aperture of a conventional camera lens. For this to work, the photo needs to be taken on an iPhone with the dual lens system in Portrait Mode. 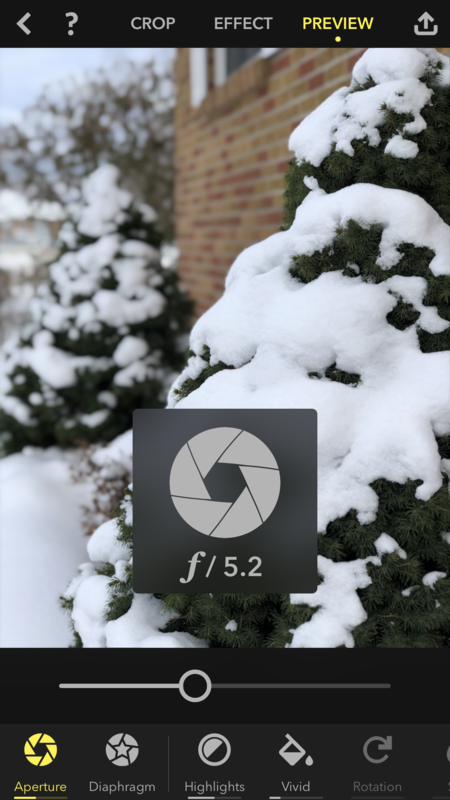 There are third party camera apps that shoot with the depth information available from the two lens configuration, but I’ve found those files don’t work in Focos. Focos has a lot more to offer as well to make the app more fun to explore and use, but you have to pay for those features either by a subscription, which is reasonable until you decide to renew this subscription year after year, or there is a one time fee that enables all the features of the app forever. I’m not a fan of the subscription model so I went for the gusto and paid for the whole thing. So let’s take a look at Focos and how it helps bridge the gap. 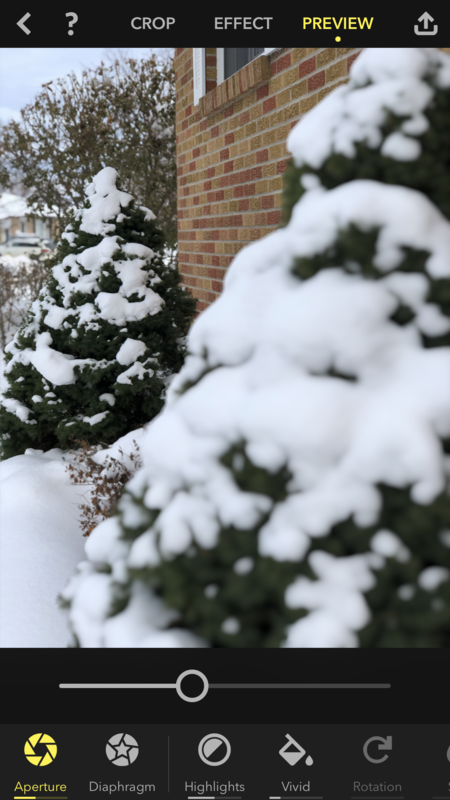 I took a photo of a pair of Dwarf Alberta Spruce trees in front of my house after a fresh snowfall using Portrait Mode on my iPhone 8 Plus. The image on the left is how it looked as it was taken with the tree in the foreground in sharp focus and the background showing the nice bokeh that Portrait Mode offers. Before Portrait Mode, the iPhone could only give us an image with a very large depth of field, even with the small aperture housed in these little lenses, and that’s all thanks to physics, which is also something I couldn’t begin to talk about. Changing the focal point of the photo is as simple as tapping the area you want in focus, and for the photo on the right, I tapped on the tree in the background. This next feature is where the real magic of Foc os happens. The slider under the image is how the “aperture” can be adjusted. 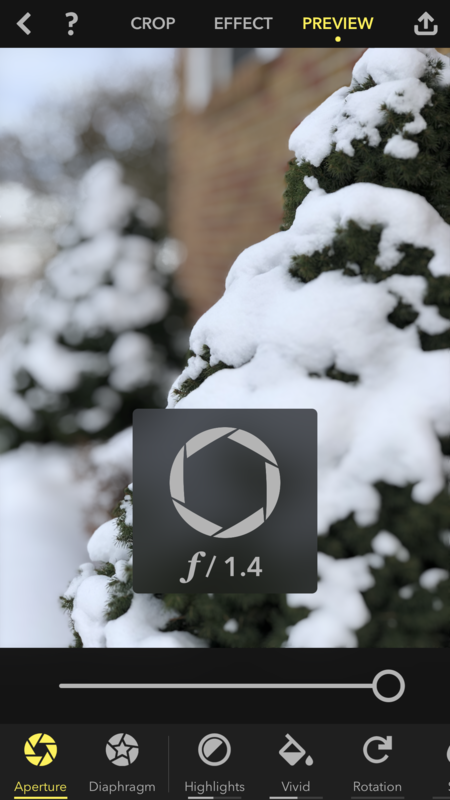 When I rest my finger on the slider, a graphic of an aperture ring appears with a value below it. I don’t know how the aperture value is calculated or how closely it resembles the aperture of any conventional lens, but as I slide my finger across the screen to adjust it, the value changes in increments of 0.1, so if anything, Focos gives us some very fine control over the depth of field. The fine adjustments here can only be made possible with computational photography because the way an aperture ring works in a conventional lens is that with every single adjustment of the aperture, the lens lets in half or double the amount of light. This changes the dynamics of the image exposure to where you have to adjust the shutter speed or the ISO to compensate for the aperture change in order to get the same brightness in the photo. 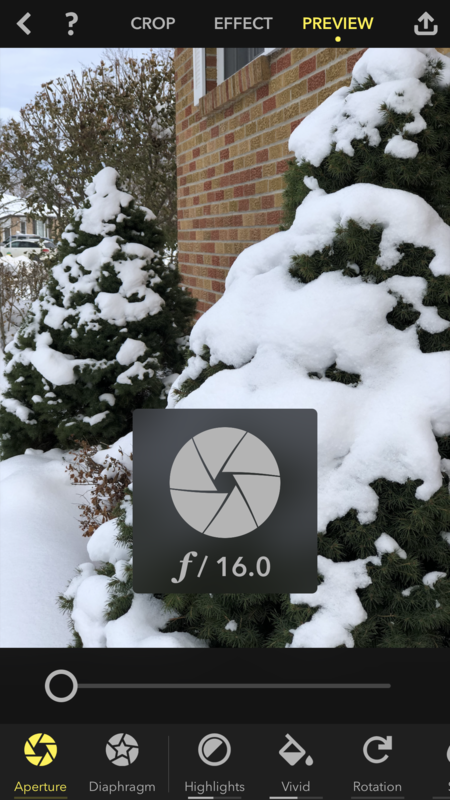 Focos is merely altering the depth of field when you make a change with this slider. Below are two versions of the photo; one with the slider all the way to the left to where the aperture bottoms out at f/16 and the other to the right where the maximum aperture is f/1.4. The left image shows as it should with a small aperture opening, a large depth of field with most of the scene in focus. The image on the right has such a small depth of field that only a portion of the tree in the foreground is in focus, which is quite similar to the effect I used to get from my 50 mm Canon lens that had a maximum aperture of f/1.8. If you own an iPhone X or plan to get one, please don’t take my words to heart. This is just my opinion and it really doesn’t matter what I think, it matters what you think. I finally got to see an iPhone X on display at the local Source store but they keep their Apple products locked to the panel so I can only use the screen, I couldn’t hold it in my hand. Here are my thoughts on the mere two minutes I spent with it. I have to say I was not overwhelmed by it. Using it was a non-issue because I know enough about the X that I was able to navigate it like I’d had one for weeks. The notch? Admittedly far less intrusive than I expected, and yes, it is very easy to get used to that. I couldn’t try FaceID but I suspect it would work well as advertised. I changed the wallpaper to match the one I’m using which is currently the purple, cloudy looking live wallpaper, and I also made sure True Tone was on and the brightness was set the same so I could get a good comparison between the two. The X’s whites were slightly whiter on the OLED screen but the colours themselves didn’t seem to jump out at me as much as I thought they would. Both screens displayed very well. I looked through the videos album in Photos to see what might be stored in this display unit, but I couldn’t rotate the device to watch it in landscape mode so I didn’t put too much time into that. The photos looked great as expected and it’s always entertaining to see what other customers come up with in these display units when they try the front-facing camera. I didn’t bother trying a selfie with the TrueDepth Camera, I’ve done the selfie thing with my 8 Plus’s rear camera and pretty much know how it would turn out. The bottom line for me is, and as nice as the iPhone X is, I’m glad I went with the 8 Plus because, for the difference in price, the extra features available in the X don’t do enough for me to draw me in. It would be nice to have the latest, new design but I’ve heard rumblings about FaceID getting hacked or fooled, however I don’t put a lot into things like that because they’re too inconclusive. I’ve been on the “s” cycle of iPhone since my first one, the 4s, and this is an upgrade year for me. The 8 could have been labelled as the “7s” but I think the all glass design change was great enough to warrant the new monicker. Plus I think it will be the final iteration of the design we’ve seen since the introduction of the 6. The iPhone X style is what we’ll see next year and beyond until the next design change happens. The new designs are tempting when they come out but I like to wait for a year for the improvements. That being said, I might be in a pickle in two years if Apple decides to introduce a new design because the X in new now. There’s a type of photography that was once never thought possible on a smartphone and that’s HDR, or High Dynamic Range photography. Dynamic Range is the range between the lightest and darkest parts of an image. The camera, any camera, cannot “see” the dynamic range that a human eye can see so in order to capture the same essence of a scene that we ourselves see, we need to do a little extra with the camera. And this can be accomplished quite easily or in a more complex manner. The simple way is to enable the HDR feature of your phone’s camera. This can be found at the top of the screen when the camera is turned on. The native HDR function in your phone will take two photos, one exposed for the highlight areas, the other exposed of the shadow areas. The phone will choose the best parts of the two frames and put them together to produce one well exposed image. To take this process further and to achieve noticeably better results there are many apps available for HDR work. The one I think works best is vividHDR, which is iPhone only, but there are plenty available for Android devices. vividHDR takes 5 bracketed exposures to produce its HDR photos, and while its best to use a tripod for this type of work, vividHDR does a great job with image alignment when shooting hand held. Also with vividHDR you are given 5 choices of image renders to save from. They are Natural HDR, Lively (a little saturated), Dramatic (more saturation and contrast), Black and White, and Faded (decreased saturation). One of my favourite camera apps, ProCamera for the iPhone, has vividHDR built in. The following images illustrate how a normal shot looks compared to a Lively HDR from ProCamera. Smartphone makers do a good job of making their camera apps work a lot like real cameras. Let’s take a look at the basic camera functions, and I should mention that I’m an iPhone guy but most phones will have buttons that are similar to what I will outline here. I’ll touch on a couple of these features in future posts.